I can't exactly remember how I found out about Bowerman's Nose. It might have been in a magazine, or a book, or even on Flickr. How I found out about this location is largely irrelevant though. My desire, or maybe obsession, in capturing an image of Bowerman's Nose that meets my artistic vision is more to the point though. 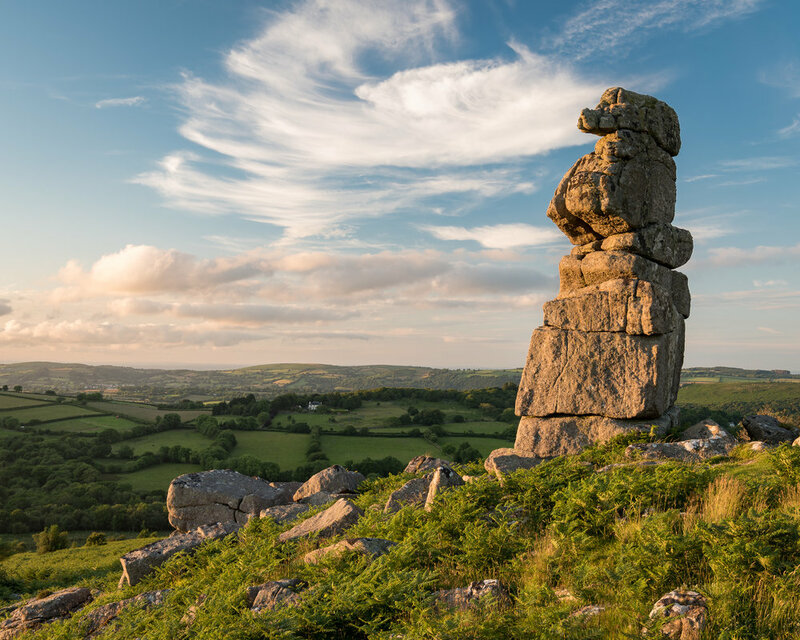 For those of you who haven't heard of Bowerman's Nose, it's a tall pillar of granite on Dartmoor. It's very distinctive and is surrounded by rolling hills. Given the right light and conditions it can make for a beautiful photograph. The problem for me is that I've never really managed to capture an image that does the location justice. Some of my early failings were due to poor technique, but latterly it's more to with poor conditions. Part of the reason I'm probably so obsessed by this particular location is its close proximity to home. It's less than a 45 min drive and it's reasonably easy to get to (as long as you don't mind opening a gate and getting creative with your parking). This means that it is often my go to location on Dartmoor when the conditions are looking favourable. I probably made my first serious attempt at photographing Bowerman's Nose in early 2015. It was January so Dartmoor wasn't at its best, and it was a very grey and flat day. However, I do like to practice my photography so just been able to walk around and look at different compositions was valuable. I returned in May of 2015 in the hope of better conditions. On this trip the ground was looking spring fresh, and I was getting some nice light reflecting of the edge of Bowerman's Nose from the setting sun. Unfortunately the sky was a bit bland and I wasn't getting the golden light I was looking for. Close, but not quite there. However, this trip did show me the real potential of the location. A week later I was back again and trying a similar composition. Again, while the image was pleasing, I just felt it lacked something. While I was there I also tried my first panorama - I think Lightroom has just been given the native capability to stitch panorama's so I thought I'd give it a go. By the time 2016 had rolled around I had committed to myself that I was going to get an image worthy of the splendid Bowerman's Nose. I think it's part of my nature. Once I decide that I need to do something, I'll work at it until I get it done. I was determined that in 2016 all my perseverance would pay off. Obviously with some elements of of my control this would not be easy. In May 2016 I captured this image of Bowerman's Nose. It had interesting sky (helped by the long exposure), but it lacked the light I was looking for. Then in June 2016 I tried again, and I have to say I thought I was going get the image that night, but again, there was just something missing that evening. The image I was looking for escaped me again, but I would try, try, try again! Then, just the other evening, with only a little time between the end of work and sunset, I did a quick check of forecast and decided that I would attempt Bowerman's Nose again. When I got there the conditions looked good so I literally bounded up the hill and got my tripod setup. Would I finally be lucky? As you can see, yes I did. Well, it is at least my best image from that location. No it's not perfect and there is always room for improvement, but it is my best and favourite image from there. I finally feel that my perseverance had paid off. So am I done with Bowerman's Nose? Now that I have the image I wanted will I ever go back? Of course I will! There is always room for improvement. There are many different compositions to be had, different lighting conditions, even snow! It's an amazing location, and being so close to home it's always going to be on my radar to go back to. So do you have a favourite location that you like going to? Is there a location you keep visiting in the hope that you'll get something special there one day? Do you preserve or just move on? Let me know in the comments.